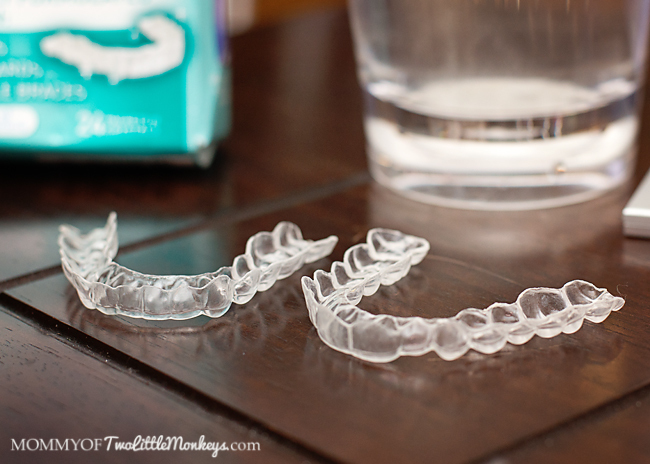 One of the hardest things that I have dealt with since having Invisalign braces was the task of keeping my plastic tray retainer clean. Since receiving them eight years ago, I’ve been scouring the shelves looking for a product that will help. My only options have been to scrub them with a toothbrush and some toothpaste or bring them into my dentist office and they would give them a deep clean. Plastic retainer trays are prone to film build up and after a while, if not cleaned properly, they can smell not so fresh. While a toothbrush and toothpaste can do the job, it leaves them looking dull, doesn’t kill off bacterial germs, makes scratches in the plastic and can drastically reduce the lifespan of your retainer. Then I heard about Fresh Guard™ by Efferdent! Fresh Guard™ is specially formulated for retainers, mouth-guards and removable braces. 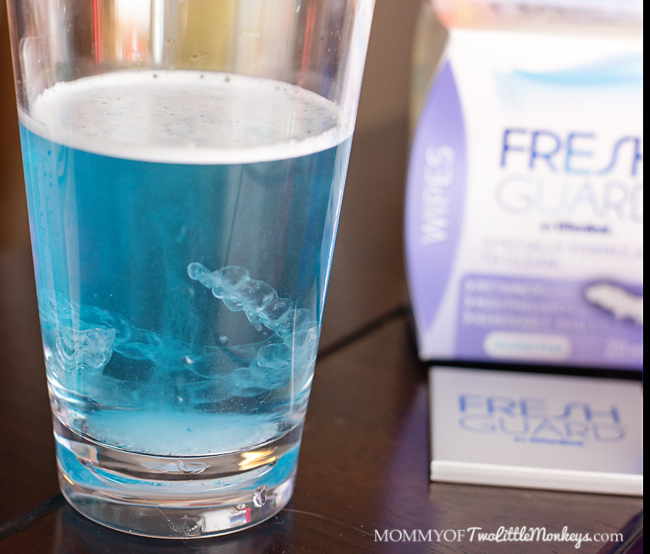 Fresh Guard™ by Efferdent Wipes, a convenient on-the-go cleaning, with no water needed. Since my retainers have never really experienced a deep clean, we started with the Fresh Guard™ by Efferdent Soak. The process was simple, just pour the tube of powder into a warm glass of water and drop in your retainer. In a matter of moments, the water fizzed up and started to work. A quick 5 minute soak, rinse under the sink and my retainers were sparkling like new! No scrubbing or brushing of the retainers needed. I am simply excited!! It’s the little things in life, like a clean retainer. When you spend so much money to make your teeth happy and straight, it’s disheartening to not have a proper regimen to keep your retainer clean. Fresh Guard is a product that is first of it’s kind on the market and really should be on a “must have” purchase list for anyone who has finished their orthodontic treatment. Disclosure: This sponsored post is part of a Tapinfluence Campaign with FreshGuard. As always, all thoughts are my own. 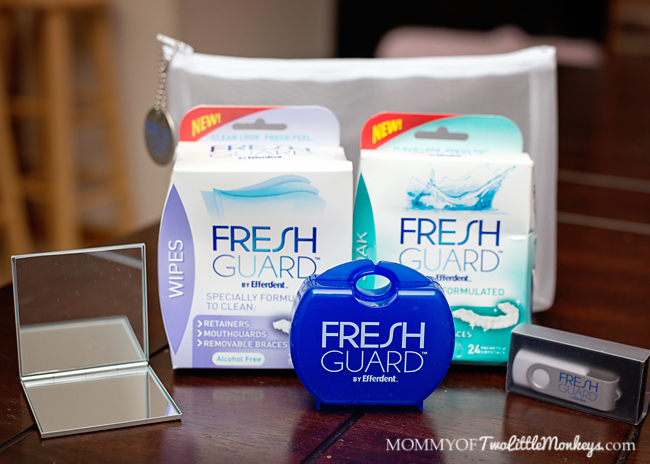 Fresh Guard™ is specially formulated to clean mouth guards, retainers, and clear braces. Fresh Guard™ Soak kills 99.9% of odor-causing bacteria in just 5 minutes while Fresh Guard™ Wipes offer a convenient on-the-go cleaning solution with no water needed. Visit Fresh Guard™ for more information, store locator and coupons! This is a sponsored conversation written by me on behalf of Fresh Guard™. I received promotional items and Fresh Guard™ products in exchange for my participation. The opinions and text are mine.